A few years ago, I started encountering disturbing reports of banks unwilling to grant small construction loans where Australian Building Industry Contracts are used. ABIC contracts are published by the Australian Institute of Architects in partnership with the Master Builders Association. They are a suite of plain English building contracts with versions suitable for major, simple and basic projects. They have been in regular use since 2008, apportion risk fairly and have been well tested in the courts. They are the primary contract type used for smaller architect-designed projects, in particular houses. At first, the issue appeared to be confined to a few very specific cases that involved the Commonwealth Bank and private house projects with contract prices under $1,000,000. The Institute intervened, and received a commitment from the Executive Manager of Valuation Risk and Secured Losses at CBA to amend the bank’s policy. Though I believe this commitment was never followed through, for a year or two the chatter about thorny bank loans seemed to die away. I remember thinking at the time that CBA’s beef with ABIC must have been an odd misunderstanding and nothing more. But then at the start of this year, the problem re-emerged and it was suddenly everywhere. The four major banks and a number of minor ones seemed to have joined the party. Houses were still the main target, but there were reports of problems both above and below $1,000,000. Bank-approved quantity surveyors were forced on clients, there was pushback against monthly progress claims, and pushback against architects. The fixed price ABIC contracts were being defined by the banks as cost plus, loans were being refused outright, and I even heard that one lender absurdly objected to the contracts’ red covers. It was bewildering, a one-sided war where the banks had all the power. Architects and their clients could do nothing more than plead reason with this or that branch manager. And then in May I received a call from a distressed ArchiTeam member, two of whose clients had just had bank loans refused outright. One had been forced to opt for an alternative building contract, and had terminated her contract administration services. The other had been investigating loan options prior to commencement, and subsequently cancelled the project entirely. On the phone, my colleague was simultaneously furious and exhausted: she was losing fees and entire projects, and no-one seemed able to do anything about it. The phone call crystallised the issue for me: in discriminating against ABIC contracts, one of the only contracts with a role on site for the architect, the banks were stealing work from the profession. But a more recent conversation with another colleague made me realise that the problem runs even deeper. I fear we’re observing the beginnings of a slippery slope. A couple of banks object to the ABIC contract suite today, and tomorrow none of the banks are willing to loan against it. Next week, with no other suitable architect-administered building contracts forthcoming, the architecture profession is forced to either work only with the mega, mega wealthy or surrender contract administration services entirely. And then next month, a generation of younger architects never gain experience on a construction site at all. The contract is for simple works. There is no progress payment schedule. Progress payments are to be paid on a monthly basis. An architect is overseeing the project. In addition to vilifying architects and singling out key characteristics of the ABIC contract as unacceptable loan conditions, CBA requires a bank-approved quantity surveyor to assess each progress payment, a condition that compromises the role of the architect and contravenes the conditions of the ABIC contract. Other major banks have similar policies: the Bank of Melbourne’s Consumer Mortgage Lending Policy stipulates staged progress payment claims. ANZ’s policy insists on a quantity surveyor to assess payments, and places a twelve month limit on construction. Macquarie Bank requires a quantity surveyor and staged payments. NAB demands staged payments, predefined variations and won’t loan against simple works contracts. It is a natural attitude of banks to favour the familiar, but such widespread opposition to architects and the ABIC contract is evidence of a more sinister motive. The banks’ systematic interference with an essential facet of the architecture profession’s service provision is alarming, as potentially transformative as the rise of the project manager or the advent of novation. I am joined in my panic by a dedicated coalition of industry bodies receptive to collaboration on an advocacy response to the banks, and eager for meaningful action. Together with my fellow ArchiTeam Director Barbara Moje, I have volunteered my time and energy to a joint advocacy initiative with Clare Cousins, National President of the Institute, and Kieren Wong, President of the Association of Consulting Architects Australia. Led by Clare, we decided in late May that our best strategy would not be to tackle the banks one by one, though we would do that if necessary, nor approach the Australian Banking Association, though we would do that too, but hitch our cart to the runaway horse that is the Royal Commission into Misconduct in the Banking, Superannuation and Financial Services Industry. And to do that, we needed more than rumours and distant anecdotes, we needed evidence. So I helped craft a research survey that would underpin our submission to the Royal Commission, to both quantify and qualify the actual effects of the banks’ behaviour on architects, clients, builders and projects. An advisory group was convened to review the survey questions, drawn from the Institute, ArchiTeam and ACA memberships, expanding and refining my early drafts. Staff from the Institute national office then helped pull the survey together and vet it for clarity. The survey went live in late June and over the following two weeks we received testimonials of 175 projects from 156 architecture practices. This was a strong response, spanning every state and territory bar the Northern Territory, and reflective of both the widespread nature of the bank problem and a common desire to fix it. In the interests of transparency and as a small way of thanking the many architects who contributed their time, on behalf of our advocacy coalition I’d like to share some of the insights gained from our research. Let’s look at the projects themselves first. Where are they? Who is working on them? What are they? What are their budgets? What contracts are they using? Which banks are giving them grief? 50% of respondents are from Victoria. 71% of respondents are in architecture practices with five people or less. 97% of affected projects are residential. 66% of affected projects have a budget less than $1,000,000 and 85% have a budget less than $1,500,000. The average project budget is around $870,000. 77% of affected projects use the ABIC small works for housing contract (ABIC SW-H). 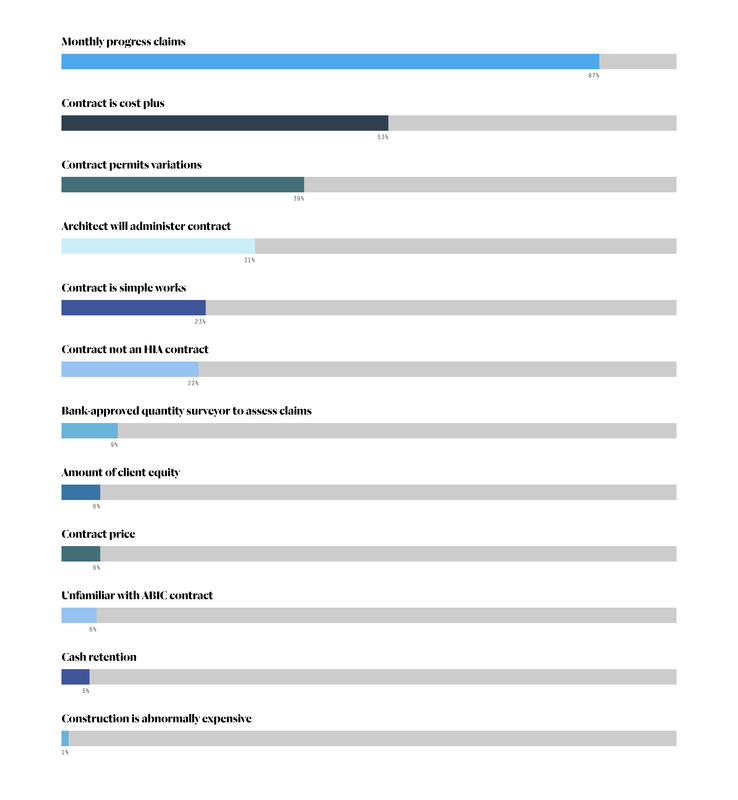 A tiny proportion of projects use Australian Standard contracts (3%). 65% of problems come from the big four banks (ANZ, CBA, NAB, Westpac). The aggregate budget of the surveyed projects is around $152,000,000. The high response rate from Victorian architects is intriguing though probably not as conclusive as it appears. It could mean that bank problems with the ABIC contracts are concentrated in Victoria, or it could just mean that the media reach for the survey was better in Victoria than elsewhere. It is perhaps more telling that the distribution of projects from the other states and territories roughly match their populations: New South Wales is the second largest state with the second highest number of respondents, then Queensland and so on. This could mean that the problem is in fact distributed evenly around the country. Though the big four banks are responsible for 65% of the problems, between them they hold 82% of Australian home loans. This means proportionally they’re actually behaving better than the other banks. The other section within the list of banks is long: it includes Macquarie Bank, Bendigo Bank, AMP, Suncorp, Bankwest, Bank of Melbourne, Bank SA, Bank First, Adelaide Bank, St. George Bank, Citibank, HSBC, and various credit unions. Let’s move onto the banks’ position on the ABIC contracts. What issues do they identify? Most widespread amongst responses is the banks’ lack of understanding of the fixed price ABIC contracts and how they work. Claims that they are cost plus (53%), that they permit variations (39%) and that they relate to simple works (23%), as well as a general lack of familiarity (6%) are all evidence of poor understanding. Overwhelmingly, the most widespread single issue is monthly progress claims (87%). Architects are singled out in a couple of ways, either via discomfort with our capacity to administer the contract (31%), or distrust in our ability to assess progress payment claims (9%). Responses to this section of our research do not add up to 100% as respondents were invited to tick as many issues as were relevant. Across the 175 projects submitted, 483 issues were identified, or 2.8 times the number of projects. Though the banks appear to be united in their dislike of the ABIC contracts, it could be an indicator that they have no real consensus on why they don’t like them. There are a few counter-intuitive issues raised here. Most prevalent is the banks’ distrust of monthly progress claims, despite the architecture profession agreeing that they are in fact fairer than staged payments and less likely to cause a builder to go bankrupt. Similarly, the banks’ preference for the HIA contract (22%) is contrary to the weaker protections it provides for clients. Now let’s take a quantitative look at the architecture practices affected by the banks’ behaviour. How are they impacted? What does it cost them? 71% of affected projects are delayed by one month or more. A very small percentage of projects are delayed by a very large period, twelve months or more (2%). The average delay is a little over two months. 59% of architecture practices spend ten hours or more attempting to resolve the issue with the banks on behalf of their clients. The average number of hours spent is a little over sixteen. 84% of architecture practices are not reimbursed for this time. 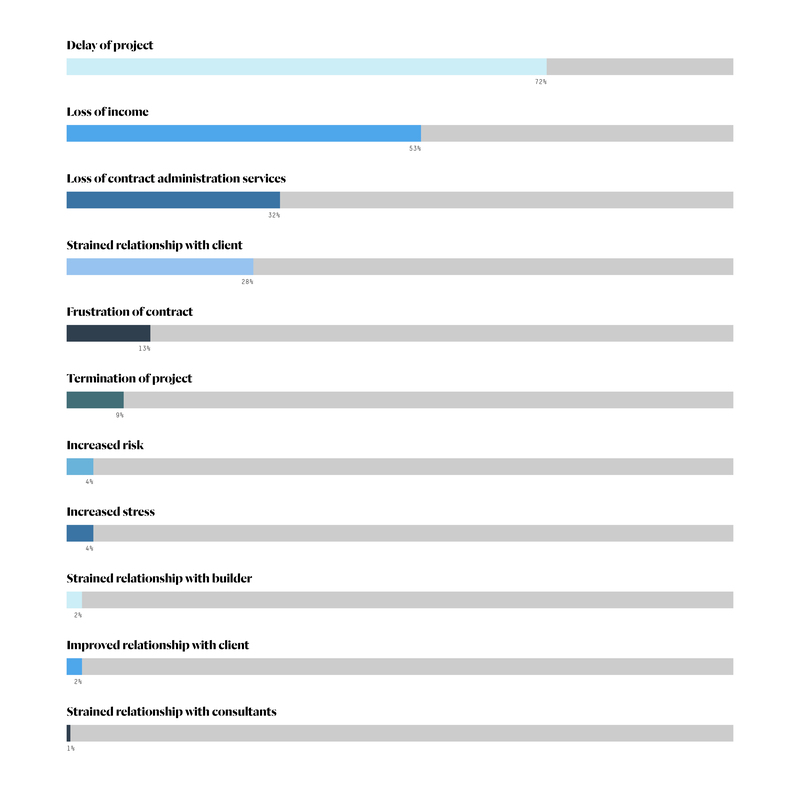 93% are either not reimbursed or are only partially reimbursed. The surveyed projects are delayed by an aggregate total of 324 months. 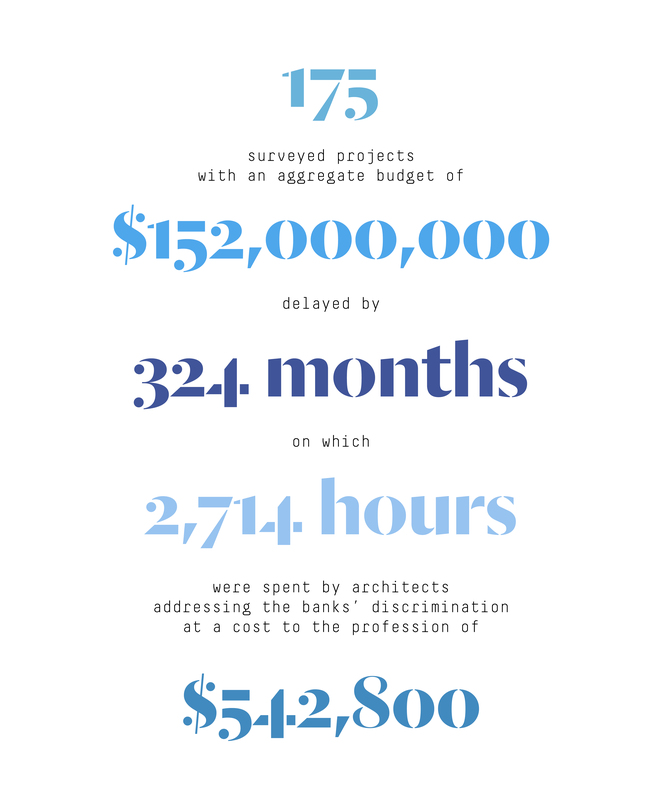 The surveyed architecture practices spend a total of 2,714 hours addressing the banks’ issues on their clients’ behalf. Based on an hourly charge out rate of $200 per hour, this equates to a cost to the architecture profession of $542,800. Of the hours spent, 2,280 are unpaid and a further 244 only partially paid. Now let’s take a qualitative look at not only the architects, but the clients and builders affected by the banks’ behaviour. How are they impacted? 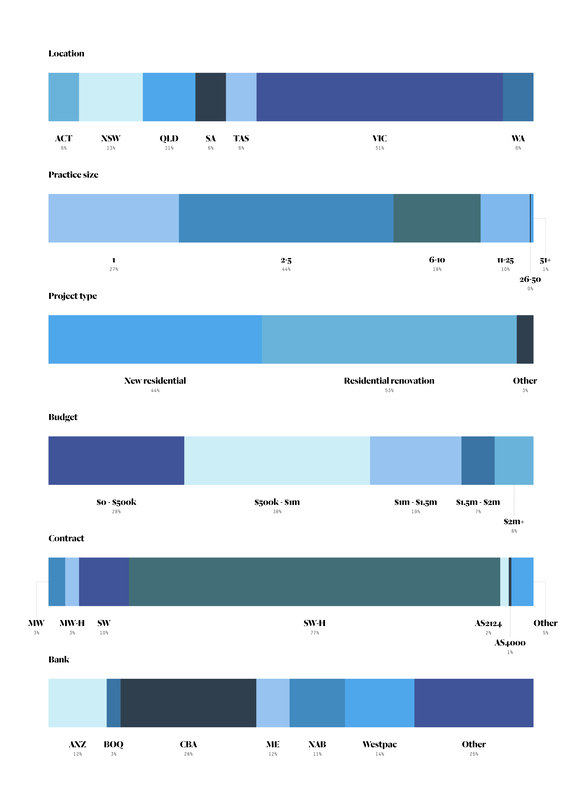 Amongst all three groups, project delays are cited most commonly (72% for architects, 35% for clients and 53% for builders). There are numerous financial implications for all three groups, including loss of income for architects (53%), increased project costs for clients (26%) and strain in cashflow for builders (14%). 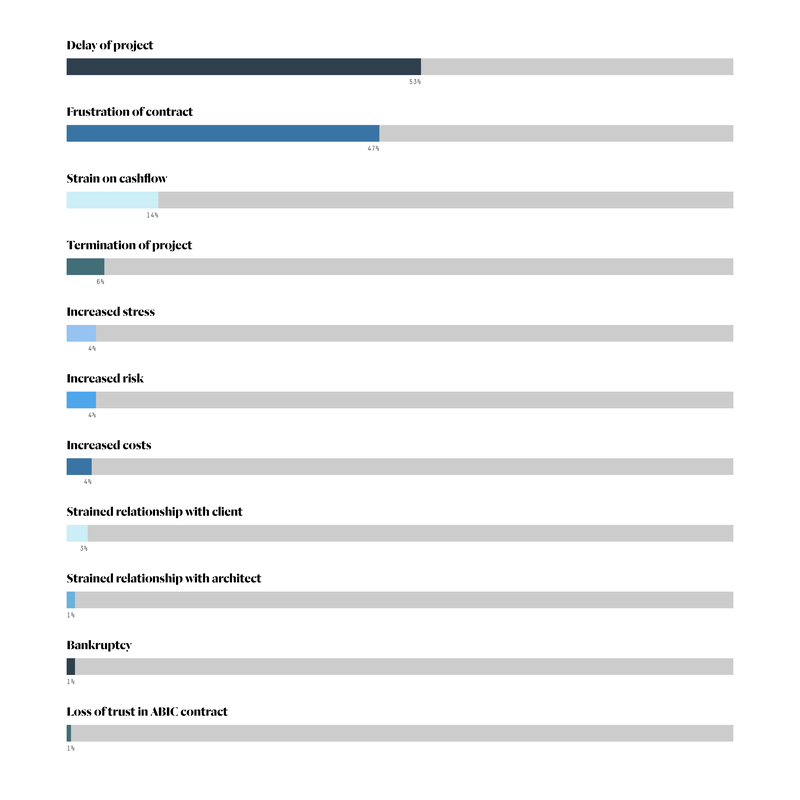 Strains on the relationships between the architect, client, builder and specialist consultants are also widespread (for 31% of architects, 35% of clients and 4% of builders). Respondents note frustration of the contract is a problem for architects a small percentage of the time (13%) and a substantial percentage of the time for builders (47%). This indicates that while it is the client who introduces the bank into the construction project, it is the builder and to a lesser extent the architect who bear the brunt of the banks’ interference. 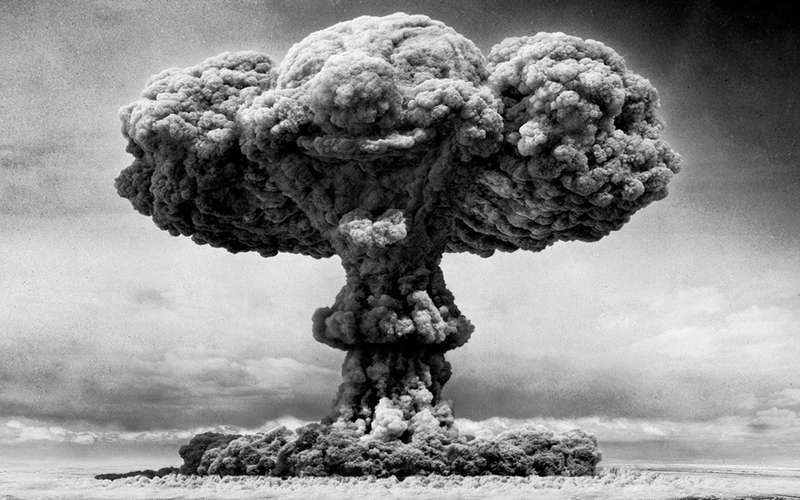 In a small number of cases, projects are affected catastrophically. 9% of architects lose the project entirely, 11% of clients lose the builder and 1% of builders go bankrupt. Though the risk of negative effects on the relationships between architect, client and builder is high, the presence of a small number of cases where the effects are positive (2%) suggest that the problem with the banks’ may be an opportunity for architects to add substantial value to their clients and projects. The institute delivered our submission to the Royal Commission on the 21st of August, a copy of which can be downloaded here. It is a document that seeks to reveal the full scope of the banks’ discrimination against the architecture profession, and against the ABIC contract suite. The testimonials we have collected have been absolutely invaluable, and as hoped underpin our entire submission. Any updates we receive from the Royal Commission will be broadcast to members of the Institute, ArchiTeam and ACA. On behalf of everyone involved in our advocacy coalition, thank you to all those who have contributed your time and energy to our research initiative. This article is published in conjunction with the Association of Consulting Architects. Australian Institute of Architects; email correspondence viewed by the author; June 2016. There are two commonly-used Australian Standard contracts with roles on site for the architect, AS2124 and AS4000, but these aren’t typically used on small residential projects. Commonwealth Bank Credit Policy on Building / Construction Loans, Bank of Melbourne Consumer Mortgage Lending Policy, and other bank loan policy documents viewed by author; August 2018. Thanks go to Melonie Bayl-Smith, Justine Clark, Shane Cox, Sam Crawford, Hayley Franklin, David Hillim, Thom McKenzie, Barbara Moje and Kieran Wong for their invaluable input. We only received testimonials from architects with projects affected by the banks, thus aren’t able to extrapolate from our sample group to the industry at large. That said, it is reasonable to assume that the survey respondents are not the only ones affected. The problem is larger, potentially much larger, than the one quantified in this article. Greg Jericho; The big four banks are getting even more powerful – at Australians’ expense; The Guardian; February 2018. A number of respondents point out that while the six staged payments regulated on volume-built houses might be suitable for their short construction periods, architect-designed houses can often take twelve months or more to build. This results in negative impacts on builders’ cashflow with progress payments typically two or three months apart. Australian Building Industry Contracts; author’s own image. 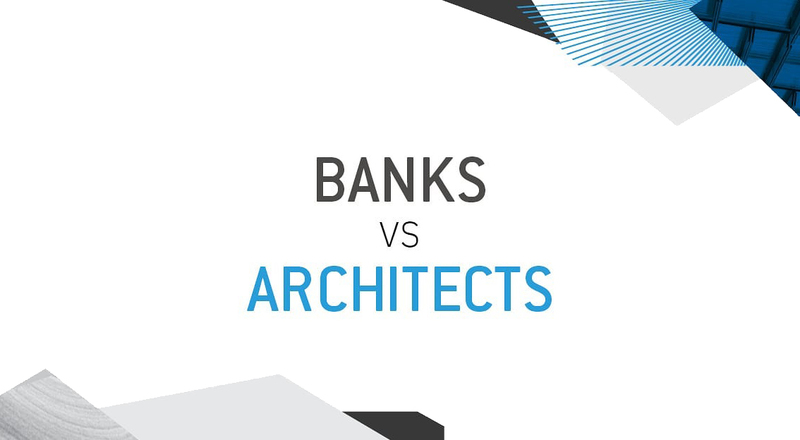 Banks vs. Architects; sourced from Australian Institute of Architects e-news mailout; 21st June 2018. Modified by author. 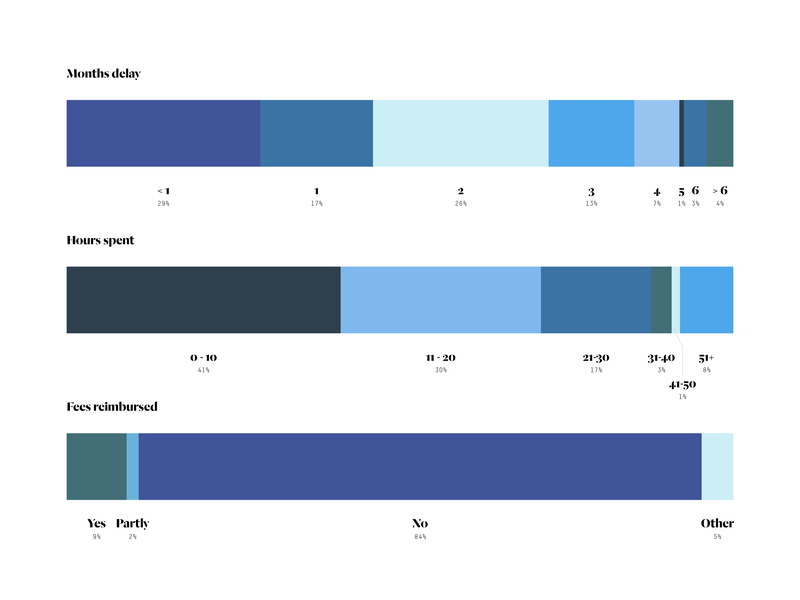 Survey overview; this and following infographics produced by author from ABIC survey data; Australian Institute of Architects in collaboration with ArchiTeam and Association of Consulting Architects Australia. The cost of the banks’ discrimination.